Ohio TeleCom will Install, Service and Repair Nortel Norstar Compact ICS Meridian Business Telephone Systems CICS in Dayton, Columbus, Cincinnati Metro Areas. buttons to use on the different types of Nortel Networks telephones. Check what is programmed on any button. Useful when labeling buttons. Briefly display the approximate length of your current or most recent call. Put a call on hold so that it can be picked up from any telephone in your Norstar system. Press ≤‡fl and dial that telephone’s extension number. that has been ringing longest is answered first. Re-route a call to another telephone, even if all its lines are busy. Press ≤°¤, then dial the extension number of the receiving telephone. Turn CCR on or off. You must enter the System Coordinator or Basic password. to your system. Dialing filters determine which numbers you can dial. 5. Press the line or intercom button of the first held call (not required on the M7100 telephone). Press ≥. The other two callers can still talk to each other. on hold. To re-establish the conference, press ≤‹. Press the line or intercom button of the caller you want to disconnect, then press ®. press ≤‹, then retrieve the second call from hold. Press ≤•‡, then press a number from ⁄ to ·(depending on your telephone). Press ≥ to set your choice. Choose one of three methods of dialing. 2. Press £ to select the mode. 3. Press≥to store the mode. automatically selected for the call. pressing √ before placing the call. ringing at your telephone. When you are on a call, block an incoming priority call. keep the handset away from the speaker during the call, and press ® to hang up. Select English as the language for the telephone display. Select French as the language for the telephone display. Select Spanish as the language for the telephone display. With a line pool, telephones can share several lines for making calls. 1. Press ≤fl› or . Send calls arriving on an external line to another telephone outside your Norstar system. feature is not available on the M7100 telephone. Generate a Link signal  to access a PBX or other host exchange. Send a message to a Norstar telephone’s display to have someone call you back. 2. Press • and £ to view your message list. 3. Press ‚ to call the person who left you the message. 1. Press ≥ while viewing a message. Change the position of your line or hunt group buttons. 2. Press the line button that you want to move. 3. Press the button to which you want to move the line. 4. Press ®. The two buttons are exchanged. 5. Switch the button caps. 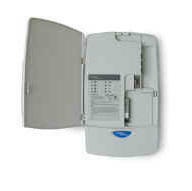 Line buttons cannot be exchanged with intercom, Answer or Handsfree/Mute buttons. Block the outgoing name and/or number on a per-call basis. speakers, or both (code 3). which is set by your installer. Again signals you to call back when the telephone or line pool becomes available. 2. Enter the ring type number (⁄ to ›). volume any time your telephone rings. can program up to four numbers or codes separated by break points. to save the number. Enter the code when you are not on a call to redial the saved number. Display the services that have been turned on at a designated control set. coordinator. User speed dial codes are used exclusively at your telephone. 2. Enter a two-digit code from 71 to 94.
button. If you don’t specify the line, the system automatically chooses a line for the call. 4. Dial the telephone number you want to program (up to 24 digits). 6. Record the code and number you have just programmed. supply. See the System Coordinator Guide for further instructions. Replace message or call information on the display with the time and date. sets with a display in your Norstar system. Send a call to another telephone within your Norstar system, or to an external telephone. depending on the capabilities of the lines. 3. Call the person to whom you want to transfer the call. 5. Press ® to complete the transfer. answered after a few rings, the call automatically rings again at your telephone. from any telephone in your Norstar system. This feature does not work for a private line. password to access this programming. 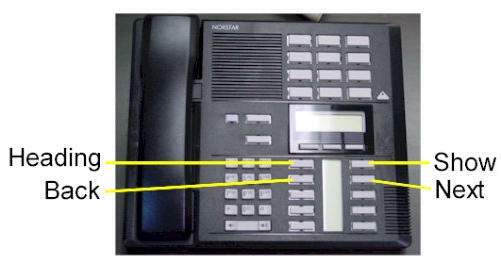 Norstar telephone without first making the other telephone ring. ≤°fi prevents your telephone from receiving voice calls. from another system before proceeding with the dialing sequence. new log item can be stored. 1. Press • to view old items. Press £ to view new items. Press ‚ to return to the last viewed item. 2. Press £ and • to move through your items. 3. Press√ to view more information on an item. 1. Press ≥ while viewing an item. 1. Display the desired number on your telephone. access, or remove numbers using √. 3. Press a line button then lift the handset. see the next setting. Press ≥ to select the displayed setting.